Our senses allow us to experience the world around us. The senses allow us to see, hear, smell, taste and touch things. Each sense is associated with a specific sensory organ. The eyes give us the sense of sight. The ears give us the sense of hearing. The nose gives us the sense of smell. The tongue gives us the sense of taste. The skin gives us the sense of touch. IMPORTANT: We have a version of this chart that can be used in your classroom. 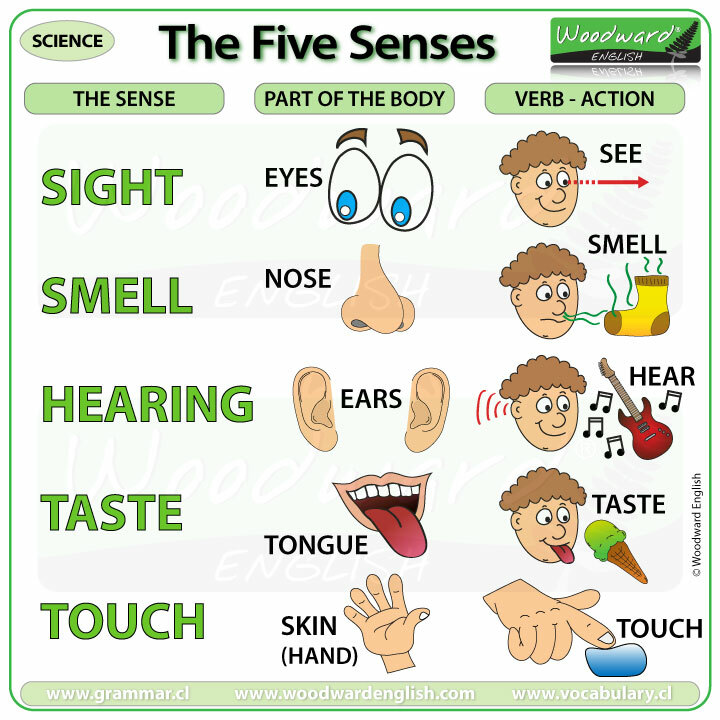 The five senses (LINK coming soon) which includes exercises and activities to practice the five senses in English. Your eyes give you the sense of sight. This sense is normally the one that we use the most as it allows us to see. Your eyes capture light and converts it into images for the brain to process. Sight allows us to see the size, form, color, and location of things that are around us or in our environment. To take care of our eyes we should read in good natural light and avoid spending too much time in front of a screen. Your ears give you the sense of hearing. This sense allows us to hear or listen to sounds that are around us. You can hear music and listen to people talking because of your sense of hearing. To take care of our ears we should listen to music at moderate levels and avoid inserting objects into the ear which may damage it. Your nose gives you the sense of smell. This sense allows us to smell and distinguish the different aromas (or smells) that things have. The smell of a rose is pleasant. The smell of garbage is stinky. To take care of our nose we should keep it clean as this helps us breathe better and to perceive different smells better. Do not insert objects into the nose that may damage it. Your tongue gives you the sense of taste. This sense allows us to perceive the flavor of the things we eat or drink and allows us to identify if it has a sweet, sour, salty, or bitter taste. To take care of your tongue, it is important to have correct hygiene inside the mouth with includes brushing your teeth regularly. Your skin gives you the sense of touch. This sense allows us to feel how something is and know its texture (smooth or rough), it’s hardness (soft or hard) and its temperature (hot or cold) when we touch it. The skin is a thin layer that covers and protects our body. Did you know that our skin is the largest organ of our body? To protect our skin, it is important to use sunblock when we are outside and to wash ourselves every day. As we have seen, the five basic senses are sight, hearing, smell, taste, and touch. Did you know that there are other senses? There is the sense of balance, the sense of temperature, and the sense of pain. These senses require a combination of the sense organs.